UXBRIDGE, Canada, Nov 9 2011 (IPS) - Canada’s Stephen Harper government is spending more than 60 billion dollars on new military jets and warships while slashing more than 200 million dollars in funding for research and monitoring of the environment. Environment Canada is roughly analogous to a combination of the U.S. Environmental Protection Agency (EPA) and the National Oceanic and Atmospheric Administration (NOAA). Environment Canada had a 1.07- billion-dollar budget in 2010, which has now been cut 20 percent to 854 million dollars for 2011-12. The EPA and NOAA budgets for 2010 were 10.3 billion and 5.5 billion dollars, respectively. Some 776 Environment Canada employees have been told their jobs may be terminated. That’s 11 percent of the current staff in a government department that has been a favourite target for budget and staff cuts for the past decade, to the point where it was barely functional, said Duck. A similar gutting of science and research is underway at Fisheries and Oceans Canada, the department responsible for protecting and managing Canada’s ocean and inland waterways including the Great Lakes. In addition, the main source of public funding for environmental science for Canadian universities has run out of money, and is expected to close early next year. Not surprisingly, scientists are leaving Canada in droves. “My international colleagues are shocked by what has happened to Canada. We were a leader in environmental science and research for so long,” Duck said. In 1988, Canada organised and hosted the world’s first high-level international conference on climate change in Toronto. The 1992 Rio Earth Summit and the United Nations Environment Programme were championed by Canada, and Canadians served as their leaders. That was then. Now, under the rubric of reducing Canada’s modest budget deficit, the Harper government has targeted programmes that inform Canadians about the state of the environment. Monitoring of heavy metals and toxic contaminants is another programme that will be crippled. These are programmes that have a direct impact on the health and welfare of Canadians, said Duck. “I’m speaking out because these cuts will be very bad for my children,” he added. Duck was the one of the few Canadian scientists willing to talk to IPS on the record. Government scientists are under a “gag order” to not to speak to media under any circumstances without permission from Prime Minister Harper’s office. Non-government scientists working at universities declined to be interviewed, fearing loss of funding or other forms of reprisal. Canadian civil society organisations know all about the Harper government’s reprisals. Many that once received funding but questioned government policy have lost their funding. For 34 years, the non-partisan Canadian Environmental Network (RCEN) successfully walked the line between the needs of government and the needs of its more than 650 civil society members. But on Oct. 13, after waiting more than six months for its expected 536,000 dollars in annual funding, the group was informed by letter it would not be coming. Ever. The network had been Canada’s best two-way communication channel between the public and the federal government on all matters environmental. Now the government says this can be done more cost- effectively online. Just six days after the pressing need to save 536,000 dollars, the Harper government awarded contracts totaling 32 billion dollars to build ships for the Canadian Navy and Coast Guard. It has also committed to spending another 29 billion dollars for 65 fighter jets. 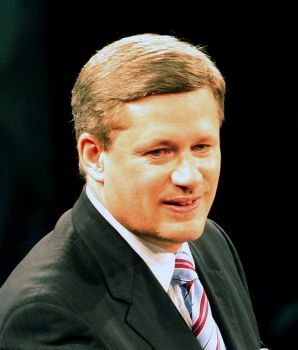 “Among the first acts of the Harper government was to cut our funding to zero,” said Hannah McKinnon of the Climate Action Network Canada (CAN Canada), an environmental NGO that used to get some government funding prior to the 2006 election. CAN Canada has obtained some funding from its more than 80 member civil society organisations. It acts as the coordinator on climate issues, and once worked with government to improve programmes and policies for the benefit of all Canadians. Now has become the de facto watchdog on government promises and actions to tackle climate change. “Canadians are deeply concerned about climate change and want their government to act,” she said. Instead of actions, the Harper government makes promises and pushes propaganda that the economy is more important and that protecting the environment comes at too high a cost, she said. The only action being taken is at the local and provincial level, McKinnon added. “If there is a need to reduce the federal budget deficit, why is Canada continuing to give the oil and gas industry 1.4 billion dollars (1.3 billion U.S.) in subsidies every year?” she asked. Harper promised to end these government subsidies in 2009. The International Monetary Fund, the International Energy Agency, the United Nations and many others have called for an end to such subsidies to the world’s most profitable industry. “Canada can’t afford to pay scientists but we can line the pockets of big oil? That is totally backwards,” McKinnon said.